The Deanery Project is a community arts and environment learning centre in Nova Scotia that's also a demonstration site for sustainable communities. With support from Bullfrog, the Deanery Project was able to install a 6 kW solar rooftop that's helping green the Nova Scotia grid. 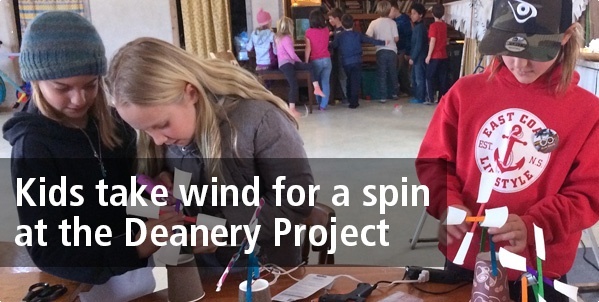 The co-op recently hosted a renewables workshop for kids that included making pinwheels, watching educational videos and building DIY wind turbine models with DC motors and LED light bulbs. We're excited to see Bullfrog customers proudly displaying their new green fuel badge on their vehicles! Bullfrog Power’s green fuel is an earth-friendly, renewable alternative to liquid fossil fuel. It enables Canadians to reduce the environmental impact of their transportation—and help green the Canadian fuel system. Click here to learn more and sign up today! Thanks to everyone who joined our Earth Hour celebration at 4Cats Arts Studio in Toronto. When the lights dimmed for Earth Hour, guests tapped into their creativity and got a little messy with glow-in-the-dark splatter painting! Stay tuned for future events from Bullfrog. Bullfrogpowered CoPower, which specializes in Green Bonds, explains how they can help finance the transition to a renewable energy-powered future. For example, money raised through Green Bonds can help fund environmentally-friendly infrastructure projects such as clean energy projects, public transit initiatives and building energy-efficient buildings. Read on. Looking to make sure your new home is energy efficient? Bullfrogpowered Cardel Homes in Ottawa offers four questions about energy efficiency that new home buyers can research or ask their builder before closing the deal. Check out the full article.